Nach Baliye started with Gautam in Sahera looking for bride. Chote Bade’s nautanki and naagin dance. Terence looks handsome in sharp nathulal moustaches. Shock of the week – Amrapali and Yash Sinha got eliminated, they are second Jodi to leave the show. I am disappointed, I think they were better than Raju and his wife. But then it’s all about voting, isn’t it! Kanika and Ankur choose lovely song “khate hai ki khuda ne”. They looked so in love and cute together. Rostrum was their prop and they used it very well. Well done both! Kiku and Priyanka superb! Dancing on “ooh la la tu hai meri fantasy” Kiku did great job. His energy confidence and dance is really commendable. This time even Priyanka gave her best, so hats off to her for matching Kiku’s energy. Kiku dressed as Bappi da looked very cute. Wishing Well was their prop. They scored 27/33, 9 from each Judge. Raju and Shikha performed on “gori tere naino mein”. It was an OK performance! Shikha was on wheelchair due to her last week injury. They also used wheelchair as their prop. As usual only Raju was dancing. They got 18/33, 6 from each Judge. Ritwik and Asha on stilt. Song was lovely “pehla nasha”, but dance was very restricted due to their prop. I completely agree with Judge Sajid, dancing was missing and only balancing was there. pLease guys next time don’t use any props, we only want to see dance. Terence – 10 Shilpa – 10 Sajid – 7 Total 27/33. In between Bharti entertained everybody with her silly comedy. Amrapali and Yash did a scary act on “ajaa gufao me aa”. I liked the performance, it was power packed. In a turnaround lift, Yash lost the grip and Amrapali fell on the floor which was a hitch. Otherwise it was OK! 24/33, 8 each from Judges. Sabse romantic Jodi of the week was declared Gurmeet and Debina. They won gulabari gift hamper and a pearl jewellery set. Stylish moment of the week went to Kiku and Priyanka Jodi. Next week its Raju and Sikha’s turn to leave the show…..let’s see what happens? 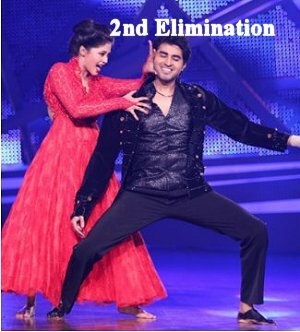 Nach Baliye 6 – 2nd week Saturday performances! Nach Baliye 6 – Week 4 Vinod and Raksha best!